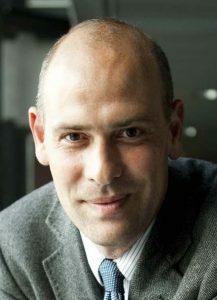 Paolo Samorì (Imola, Italy, 1971) is Distinguished Professor (PRCE) and director of the Institut de Science et d’Ingénierie Supramoléculaires (ISIS) of the Université de Strasbourg (UdS) where he is also head of the Nanochemistry Laboratory. He is also Fellow of the Royal Society of Chemistry (FRSC), fellow of the European Academy of Sciences (EURASC), member of the Academia Europaea (MAE) and junior member of the Institut Universitaire de France (IUF). He obtained a Laurea (master’s degree) in Industrial Chemistry at University of Bologna in 1995. In 2000 he received his PhD in Chemistry from the Humboldt University of Berlin (Prof. J. P. Rabe). He was permanent research scientist at Istituto per la Sintesi Organica e la Fotoreattività of the Consiglio Nazionale delle Ricerche of Bologna from 2001 til 2008, and Visiting Professor at ISIS from 2003 til 2008. He has published >250 papers on applications of scanning probe microscopies beyond imaging, hierarchical self-assembly of hybrid architectures at surfaces, supramolecular electronics, and the fabrication of organic-based nanodevices. His work has been awarded various prizes, including the Young Scientist Awards at E-MRS (1998) and MRS (2000) as well as the IUPAC Prize for Young Chemists (2001), the “Vincenzo Caglioti” Award (2006) granted by the Accademia Nazionale dei Lincei (Italy), the “Nicolò Copernico” Award (2009) for his discoveries in the field of nanoscience and nanotechnology, the “Guy Ourisson” Prize (2010) of the Cercle Gutenberg (France), the ERC Starting Grant (2010) and the CNRS Silver Medal (2012). He is member of the advisory boards of Advanced Materials, Small, ChemPhysChem and ChemPlusChem (Wiley-VCH), Chemical Society Reviews, Chemical Communications, Journal of Materials Chemistry and Nanoscale (RSC). The research of the Nanochemistry Laboratory of ISIS is focused on unravelling and controlling the architecture vs. function relationship in complex and multicomponent supramolecular graphene-based and conjugated materials for organic electronics, to ultimately fabricate prototypes of multifunctional (supra)molecular nanodevices operating at surfaces.